Summon: +4/+4 and Guard if you have an action, item, and support in your discard pile or in play. Voice of Balance is an epic Neutral creature card. It is part of the Forgotten Hero Collection. It is available as part of the Forgotten Hero Collection. This card's summon ability applies the Balanced card effect. 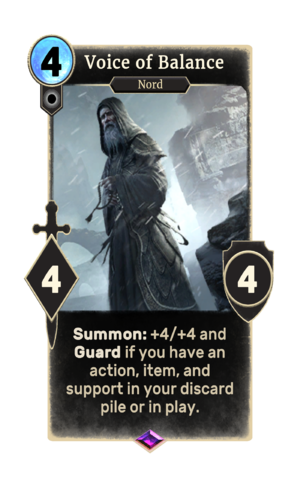 The card's art depicts one of the Greybeards, who first appeared in Skyrim.